Robert B. Cialdini, Ph.D. is a social psychologist who is currently a Regents’ Professor of Psychology and a W.P. Carey Distinguished Professor of Marketing at Arizona State University where he has also been named Distinguished Graduate Research Professor. He is an internationally respected expert in the fields of persuasion, social influence, compliance, negotiation, and social norms. 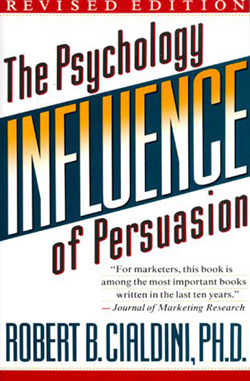 His books Influence: Science and Practice and Influence: The Psychology of Persuasion are the result of years of study into the reasons that people comply with requests in business and other settings. Together, they have sold over a million copies and have been translated into twenty languages and consistently rank within the top one half of one percent of books sold on Amazon.com. Influence has been listed on the New York Times Business Best Seller List. Fortune Magazine lists Influence in their “75 Smartest Business Books”. In the field of influence and persuasion, Bob is the most cited social psychologist in the world today. Bob is President of Influence At Work, an international consulting, strategic planning, and training organization based on the Six Principles of Influence. His clients include such organizations as Advanta, IBM, Washington Mutual Group of Funds, Coca-Cola, KPMG, AstraZeneca, Ericsson, Kodak, Merrill Lynch, Nationwide Insurance, Pfizer, Northern Trust, Prudential Financial, Mayo Clinic, Glaxo Wellcome, Harvard University  Kennedy School, The Weather Channel (United States), United States Department of Justice, NATO, Microsoft, and Charles Schwab Corp.
Bob is best known for his popular book on persuasion and marketing, Influence: The Psychology of Persuasion. His book has also been published as a textbook under the title Influence: Science and Practice. In writing the book, he spent three years going “undercover” applying for jobs and training at used car dealerships, fund-raising organizations, telemarketing firms, and the like, observing real-life situations of persuasion. The book also reviews many of the most important theories and experiments in social psychology. Harvard Business Review lists his research in “Breakthrough Ideas for Today’s Business Agenda”. Reciprocation – People tend to return a favor. Thus, the pervasiveness of free samples in marketing. In his conferences, he often uses the example of Ethiopia providing thousands of dollars in humanitarian aid to Mexico just after the 1985 earthquake, despite Ethiopia suffering from a crippling famine and civil war at the time. Ethiopia had been reciprocating for the diplomatic support Mexico provided when Italy invaded Ethiopia in 1937. Commitment and Consistency – If people commit, verbally or in writing, to an idea or goal, they are more likely to honor that commitment. Even if the original incentive or motivation is removed after they have already agreed, they will continue to honor the agreement. For example, in car sales, suddenly raising the price at the last moment works because the buyer has already decided to buy. Authority – People will tend to obey authority figures, even if they are asked to perform objectionable acts. He cites incidents, such as the Milgram experiments in the early 1960s and the My Lai massacre. Liking – People are easily persuaded by other people that they like. He cites the marketing of Tupperware in what might now be called viral marketing. People were more likely to buy if they liked the person selling it to them. Some of the many biases favoring more attractive people are discussed. Bob authored Harnessing the Science of Persuasion, coauthored Yes! : 50 Scientifically Proven Ways to Be Persuasive, Social Psychology: Goals in Interaction, Reinterpreting the Empathy-Altruism Relationship: When One into One Equals Oneness, Understanding The Decision to Participate in a Survey, Empathy-Based Helping: Is It Selflessly or Selfishly Motivated?, Two Indirect Tactics of Image Management: Basking and Blasting, Social influence: Compliance and conformity, and Imagining Can Heighten or Lower the Perceived Likelihood of Contracting a Disease, and coedited The Practice of Social influence in Multiple Cultures. Bob earned his B.S. in Psychology at the University of Wisconsin in 1967 and his Ph.D. in Social Psychology at the University of North Carolina in 1970. He was made Fellow of the American Psychological Society in 1997. He was the Recipient of the Distinguished Scientific Achievement Award from the Society of Consumer Psychology in 2000. He was made Fellow of the American Psychological Association, Division 23, in 2002. He was made Fellow of the American Psychological Association, Division 8, in 2003. He was the Recipient of the Peitho Prize for Distinguished Contributions to the Science of Social Influence from the Editorial Board of Social Influence in 2006. He was the Recipient of the Distinguished Member Award for Outstanding Contributions to the Field of Psychology from Psi Chi: The National Honors Society in Psychology in 2006. He was the Recipient of the Donald T. Campbell Award for Distinguished Contributions in Social Psychology from the Society of Personality and Social Psychology in 2006. Watch Bob present some information about influence.